Angel's trumpet is a spectacular drama queen in the garden, with huge, sweetly-scented blossoms suspended from its branches. 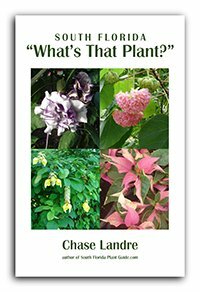 This exotic shrub puts on a fantastic show, blooming on and off all year, more in warmer weather. With flower colors in shades of pink, peach, yellow and white, the lily-like blossoms can be up to 12 inches in length. They can float over a walkway or above smaller plants like a floral "chandelier." Place these shrubs near areas where you can enjoy their beauty and the fragrance of the blossoms. 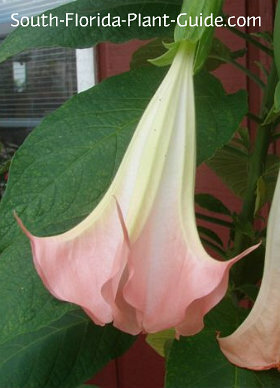 An angel's trumpet plant can be trained to grow as a small tree, with single or multiple trunks. These shrubs contain toxins (they belong to the Nightshade family of plants - which includes tomatoes, believe it or not, which actually have poisonous leaves). When you handle a brugmansia, wear gloves if your skin is sensitive - or at least avoid the urge to rub your eyes. 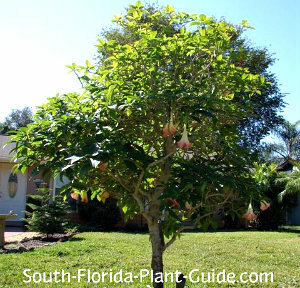 This plant can be dangerously toxic if ingested, so we recommend planting angel's trumpet in a side or back yard - or any area that's not easily seen from the street. Young people have been known to use the flowers to get high - with disastrous and even deadly results. Also avoid planting in areas where pets and young children might come in contact. Part sun to part shade seems to be what this shrub likes best, though it does just fine in a full sun location. This is a moderate grower that can reach 10 feet, though you can keep it 5 or 6 feet tall. An angel's trumpet plant does best in Zone 10. If you live in Zone 9B, you can grow it in a container to bring inside when temperatures drop. It's evergreen unless winter is harsh, so place in an area sheltered from wind. Cut back the plant for size in spring (late March or early April). Trim lightly after each bloom cycle (during warm months) for fuller growth and more blooms. Water on a regular basis, allowing the plant a bit of time to dry out between waterings. Fertilize 3 times a year - spring, summer and autumn - with a good granular fertilizer. Supplement feedings, if you want, with bloom boosters like bone meal and/or liquid fertilizer to promote more flowering. Place these shrubs 3 or 4 feet apart. Come out from the house 3 to 4 feet. If you're growing it as a tree, allow 5 feet between it and the next large plant. For placing along a walk, come in 4 or 5 feet. These make excellent plants for growing in large containers. 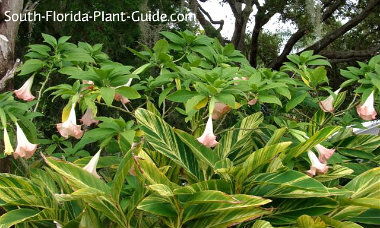 COMPANION PLANT SUGGESTIONS: Cat palm, variegated ginger, tibouchina, golden pothos, white bird of paradise, hair grass, heliconia, petrea vine, and dwarf oyster plant.